Over the Easter long weekend, I helped out a friend who wanted to revamp her living room. It was time for a new look and a fresh feel. This of course, involved getting some new furniture to work with, and the internationally iconic IKEA was the first port-of-call for this. With this decision made, we made tracks for our local IKEA store in Tempe. Tempe). The outlet is just 10 minutes away from Sydney CBD, and can be reached best by car, or buses traveling along Princes Highway. Trust me, it can't be missed. Welcome to the world of IKEA. 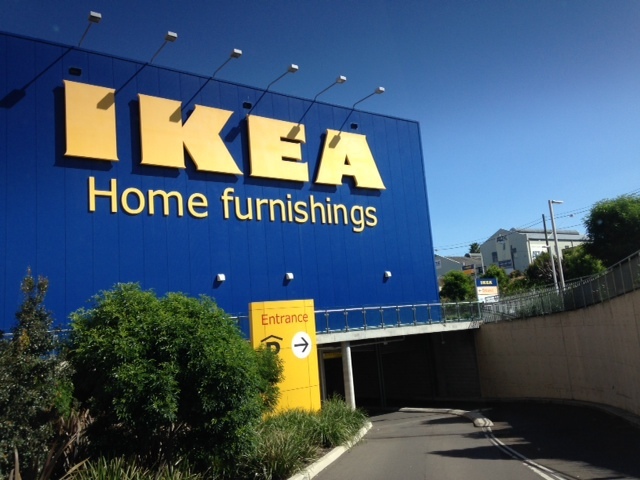 Stepping inside this IKEA store was like taking a step into another world. It was amazing strolling through the array of home displays - each of which displayed a large variety of IKEA furniture and home-ware items. My friend felt pretty spoilt for choice by all of the styles and colours of furniture that could be taken home to live with her. I was impressed by how neat the home displays were, and it was helpful how they allowed you to picture what a certain item of furniture would look like among other pieces in your home. 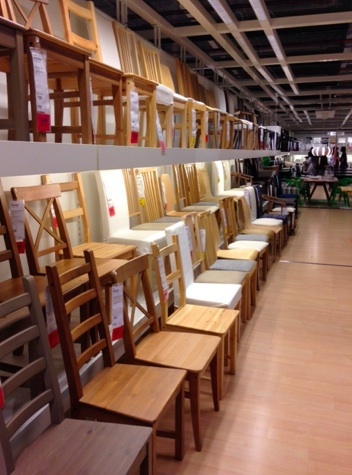 I was also amused by the rows of items like these chairs below, and the variety in styles that this showcased. 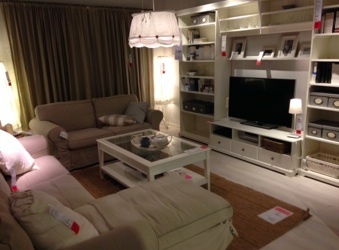 Home display of a living room - decked out in IKEA items. 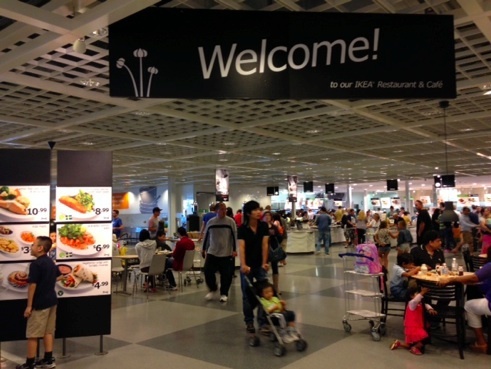 One of our favourite things about this IKEA store would undoubtedly have to be the restaurant. Specifically, the cheap and tasty meals that it serves. I took the opportunity to taste some Swedish flavours with the pork and beef meatballs for just $11.99. My friend, following her sweet-tooth, decided to go for a traditional Swedish marzipan cake for just $3.49. We had planned to go elsewhere to furniture shop after our meal, but as we were about to leave, an amazing display caught our eyes. 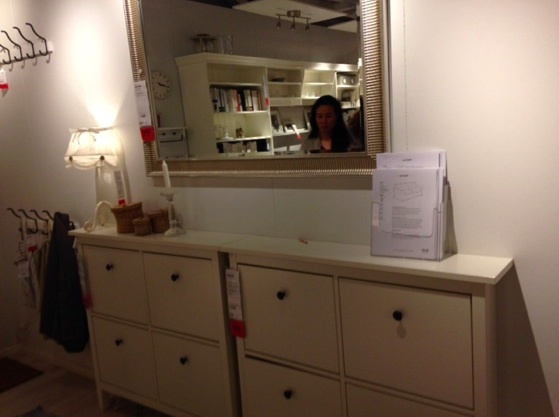 My friend admired this mirror and shoe-cabinet of a cream colour-theme and concluded that taking these home would be the perfect first-step in the refreshment of her living room. It was great to have these items in possession. However, the mirror and shoe cabinet pieces were on bulky side, and we thought they were too heavy for both of us to lug around. Now, IKEA does offer the service of delivering items straight to your door (starting from about $59 - but check the pdf for more details on pricing). We thought about whether there were any alternatives for this and I remembered somebody else recently making mention of the online task-outsourcer, AirTasker. AirTasker is an online server that is founded and based in Sydney, and which is partnered by Careerone. It is designed to match people who need to get everyday tasks done, with others who are seeking a quick and super casual way to make some cash. So, we put a post out on AirTasker asking for someone to pick up the mirror and shoe-cabinet and additionally to assemble these things for us once back at my friend's apartment. AirTasker also allows you to provide the price that the poster is prepared to pay - in our case, we offered $80 (to be paid via Paypal). Within just five or so minutes of posting, we received a few hits and by looking at the verified reviews of each person we decided to hire a guy named Sean. He had a van and accepted to do the errand for us at the fee we offered. 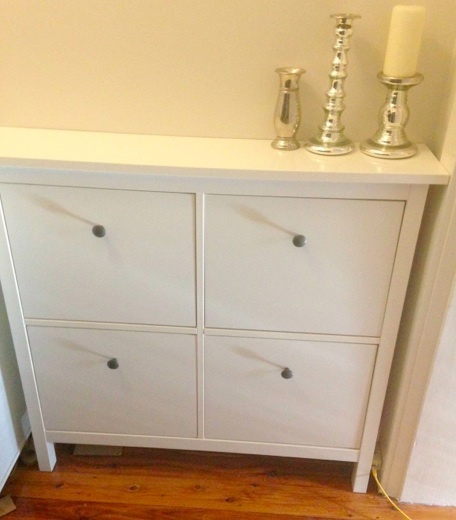 In less than 24-hours, my friend had her IKEA furniture delivered at home and assembled. Thanks to the help of Sean and Airtasker. We later wrote a positive review for Sean on Airtasker and would recommend that you give Airtasker a go the next time you need help with an everyday errand. Contrarily, why don't you take the opportunity to make some fast cash by helping someone out with these tedious tasks? The finished products, thanks to IKEA and AirTasker. When: Being online, AirTasker can be used anytime, any day. Where: AirTasker operates primarily in the Sydney region for now. Cost: The choice of how much you will offer someone for a task is all yours. Air Tasker, what a great idea. I will definitely use it in the future. Great concept. ill give it a look for sure.